Welcome to the Peugeot e-LEGEND concept, a car that makes the future, well, retro. The Paris Motor Show is where Peugeot will be displaying their latest concept to the public, and many are really looking forward to this, their all-electric and totally autonomous, take on the iconic 504 Coupe. One glance at the gallery and you'll spot those classic lines of the 504 Coupe flowing through the electrified veins of the Peugeot e-LEGEND. The design is a retro-futuristic fusion of old and new, based – according to Peugeot – on the “realistic” proportions of a traditional three-box coupe. As flashy as the concept may look, Peugeot has actually built it with showrooms in mind, which means that it's a lot more functional than the traditional pie-in-the-sky concepts with crazy proportions. For instance, the windows are regular sized and actually work and it rides on production car size 19-inch wheels. The front end is a modern interpretation of the 504 Coupe's four-piece headlights on either side of a flat faux honeycomb moulded grille sporting an illuminated Peugeot badge. The double lighting modules are separated by Peugeot's more contemporary "triple claw” lighting signature details, which are carried through to the taillights too. Below the lighting fixtures – both front and back – are protruding aluminium 'beams', painted black, in a nod to the classic car bumper. Peugeot design boss, Gilles Vidal, said these types of bumpers is what he wants to explore for future production models. “You need a certain length of material to absorb shocks. As the regulations grow harder and harder for the good reasons of safety, it means the front overhangs of cars grow bigger and bigger. It’s a very modern and contemporary reason to use this kind of touch. “It would be amazing, but probably hard to achieve. It is an idea we want to explore”, he explains. There are still some futuristic elements dotted around the exterior, such as cameras instead of side mirrors, and C-pillar's containing small displays that show a welcome message when unlocking, as well as charge status once inside. And talking about being onboard, the cabin is a luxurious mix of technology and classic materials. The seats are covered in silk velvet while 60s style wood replaces more contemporary materials like plastic and carbon fibre. There are various digital displays to look at, the main, curved, 49-inch infotainment display sits above the footwell while the digital instrument display is just behind the wheel. There is a pair of 29-inch screens acting as door cards and two more 12-inch displays hidden in each sun visor. and the whole shebang is either voice -activated or controlled via a six-inch touchscreen and rotary dial between the two front seats. 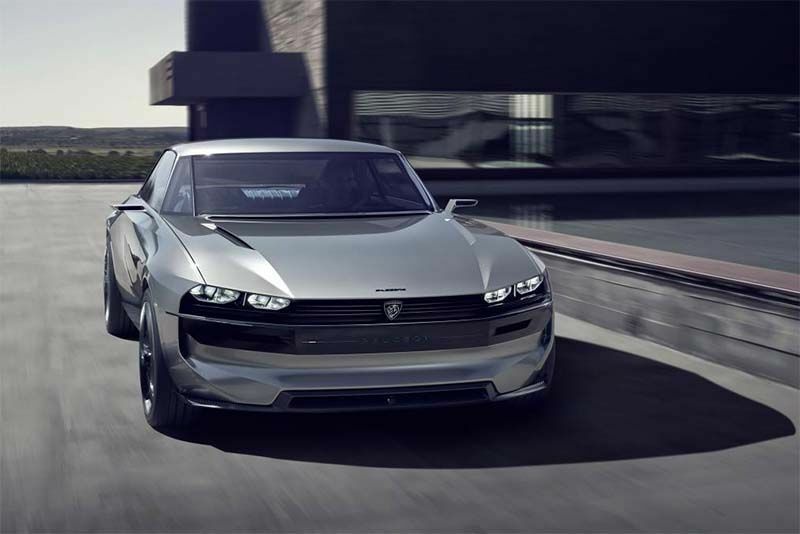 The 456bhp, 800Nm all-wheel-drive e-LEGEND has a bespoke electric platform carrying a 100kWh battery pack and, according to Peugeot, can shoot from 0-62mph in less than four seconds and on to a top speed of 137mph. They also reckon its got a range of 373 miles and their rapid charge tech takes just 25 minutes to reach 80 per cent full. Sounds amazing... but it’s hypothetical for now. Peugeot reckons it's a “realistic vision” of what’s EVs are capable of and have set a target for 2025. Let's not forget another important feature Peugeot is punting here, the e-LEGEND's autonomous driving capabilities. Hit the switch and the front seats recline as the steering wheel folds neatly into the dash. There are two modes to choose from, the first is more relaxed as the screens peel back the information that's displayed, leaving the cabin and its occupants chilled and relaxed. The second mode unleashes a comprehensive barrage of connectivity features including what the vehicle and its drivetrain are up to. Unfortunately, as much as Peugeot has developed the e-LEGEND with real-world proportions, Vidal told Auto Express: “It’s not in our plans for now”, given the tiny size of the coupe segment in Europe. “You can always make something like this economically viable but it’s always then the question of how much money do you put on the table for how much gain afterwards. There is an obvious gain in terms of brand image, but it’s a tricky question for the top management of the company. Positive feedback helps, but it doesn’t wrap up the decision”.